This game is a regular event game with "HOLD" numbers B1 - O75 "Dab 3 To Win"
A 1-window BINGO EVENT game. To play, the player would open the 1 window on the backside to reveal the symbols. 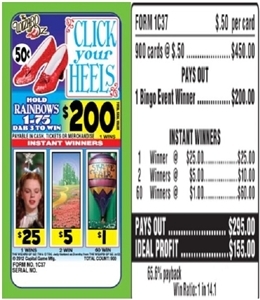 If the symbols inside the ticket match the winning combinations on the front, the player is a winner. All winners will have the Cash Payout feature showing the amount won. #1 To Play with a Bingo game: To start, the operator will announce in which game Click Your Heels game with serial #______, will be played and then will sell the tickets.